The year 2016 was not easy for Egypt, with major milestones, economic shifts and legal struggles affecting all corners of society. The art seen was no exception, with many venues facing closure and numerous institutions struggling with new budget plans. Though artists were not spared from this year’s challenges, they did remain as active as ever. There were dozens of moments of pride and success, big strides and accomplishments, and food for thought delivered through important exhibitions. A number of Egyptian artists have earned prestigious awards and recognition in the international art scene, including rising photographer Nourhan Maayouf, who won the main prize at the 2016 Barclays L’Atelier, South Africa's most prestigious contemporary art competition. Maayouf is the only Egyptian to win the main award in the competition's history. In her winning project July Tale, Maayouf presented a poignant depiction of miscommunication in a complex relationship through a series of three staged portraits. Artists Bahia Shehab and Wael Shawky were shortlisted for the Victoria and Albert Museum’s (V&A) Jameel Prize, an international award for contemporary art and design inspired by Islamic tradition. Coincidentally, both artists delved into history, but with wholly different approaches. Shawky’s selected project Cabaret Crusades: The Path to Cairo (2012) tackles the crusades from an Arab perspective based on Amin Maalouf’s 1983 book The Crusades Through Arab Eyes. The historic religious wars are whimsically presented through handcrafted glass marionettes. In her project A Thousand Times No (2010), graphic designer Shehab looked at the history of the Arabic letter lam-alif, which spells the word for "no" in Arabic, through a Plexiglas installation and a book documenting her extensive research. Doa Aly was also shortlisted for another prestigious award, the 9th Abraaj Group Art Prize. Although the prize winner is yet to be revealed in March during Art Dubai 2017, the three shortlisted artists earned a cash prize and will have their work showcased in a curated group exhibition at the fair. The artist is represented by Cairo's Gypsum Gallery, which also had a good year, with Aly’s win marking the fourth consecutive year for an artist from the gallery to be on the prize's list. Gypsum continues with a string of accomplishments this year, with artist Basim Magdy, represented by the gallery, winning Deutsche Bank Artist of the Year. In October, the gallery participated for the first time in Frieze London Fair – an annual art fair featuring more than 160 of the world’s leading galleries – to represent Egyptian artist Mahmoud Khaled. Khaled's performance work is called 'Untitled (Go-go Dancing Platform) Speaks' and draws from a 1991 piece by Felix Gonzalez-Torres. The gallery also participated with Khaled and Doa Aly's work in the Swiss Liste Art Fair in Basel, which is considered one of the most important platforms internationally for young galleries. In January, Gypsum’s founder Aleya Hamza was in Kuwait, curating a group show titled Complicity, featuring the work of seven artists at Sultan Gallery, a world-famous established gallery that was founded in 1969. 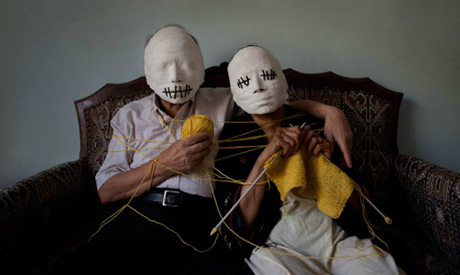 Four of the artists were Egyptian – Doa Aly, Nermine Hammam, Mahmoud Khaled, and Shady El-Noshokaty. In February, Egyptian artists participated in the Live Ideas Festival in New York, with a number of films and dance pieces. Maha Maamoun screened four films at the festival; 2026 film, Shooting Stars Remind Me of Eavesdroppers, Night Visitor, and Domestic Tourism II. Artists Doa Aly, Shaymaa Aziz and Lana Al-Sennawy were featured with the short films Tress of Hair, Love Dance, and Nuovo Cinema Paradiso, respectively. The Adham Hafez Company, which has been producing contemporary dance, music and installations, also contributed with three dance pieces. In the exhibition, prolific artist Hassan Khan displayed his installation titled Bank Bannister (2010), alongside Iman Issa's installation Heritage Studies no. 10 (2015). 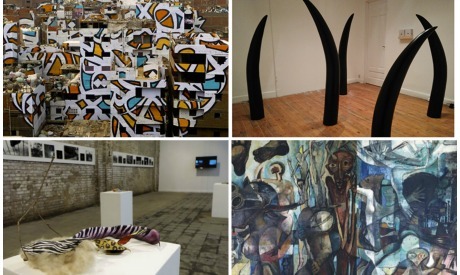 July marked a group exhibition for Egyptian artists titled Debunking Orientalism at Washington’s branch of SYRA Arts Gallery, which also operates in Cairo and represents 25 Egyptian artists in the United States. Showcasing both established and emerging artists with works ranging from abstract to landscape to calligraphy, the exhibition featured 13 diverse artists; Ahmed Morsi, Muhammad Mahdy, Farouk Hosny, Adel El-Siwi, Armen Agop, Essam Darwish, Galila Nawar, Mina Nasr, Mohamed Ardash, Ramses Marzouk, Yasser Rostom, jewelry designer Azza Fahmy, and Marwa Adel. The award winning Marwa Adel also had her own exhibition in January in Indiana, at the David Owsley Museum of Art. Titled ‘1 in 3: What Does It Take for You To Be Outraged?,’ the exhibition centred on gender-based violence, in line with Adel’s work in tackling controversial issues in contemporary Egyptian society. To top off Egypt’s successful international presence, Egyptian painters Omar El-Nagdi, Mahmoud Said and Hamed Ewais have set records with the three highest sales respectively at Christie’s Dubai auction ‘Modern and Contemporary Art, Now and Then,’ which was held in March. Both El-Nagdi and Ewais also topped their personal records that evening. Artists also made waves in Cairo with several important events and exhibitions taking place throughout the year that point to a vibrant, developing art scene. The annual Roznama exhibition expanded into three venues after being held at two spots last year (Contemporary Image Collective and Medrar). This year, the fifth Roznama stretched across Medrar, Mashrabiya Gallery, in addition to the budding Soma Art School and Gallery. 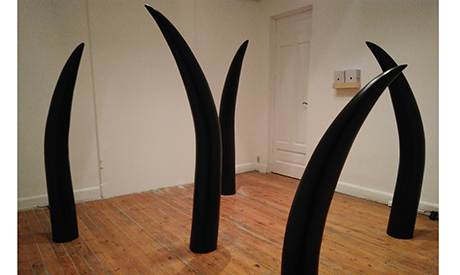 This latest edition was able to include more works, better awards, as well as new cooperation, as Medrar teamed up with Peacock to curate and organise the exhibition. Contemporary Image Collective (CIC) continued with its extensive long-term series of exhibitions titled If Not For That Wall, tackling different forms of imprisonment and isolation. Three chapters of the project were unveiled in three exhibitions; Chapter one, ‘Greetings to Those Who Asked About Me,’ opened in October last year, chapter two, ‘Chronic,’ opened this April, and chapter three, ‘Evasive Routes,’ opened in November and closed this month. The long-term series format, which is not often used, is refreshing, opening up the subject of imprisonment both vertically and horizontally. It provides audiences with a chance to examine the topic’s breadth through the different angles tackled by multiple artists, as each exhibition featured a different group of artists. It also pulls us into the depths of the subject, pulls us to think and examine it not only through the strong artworks themselves, but by the power of obtrusion, as one exhibition after the other commands attention on the dense topic. 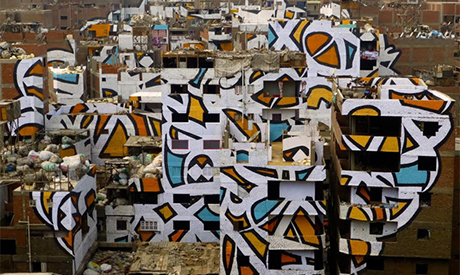 On a different note, famed Tunisian artist eL Seed turned heads by unveiling his calligraphy mural covering the faces of around 50 different red-brick buildings in the working class Zaraeeb community of Cairo’ Manshiyat Nasser neighbourhood. eL Seed’s piece – which is titled ‘Perception’ and reads: “Anyone who wants to look at the sunlight clearly must first wipe his eyes” – shed light on the Zaraeeb area, where people make their living recycling and reusing Cairo’s piles of discarded waste. The artist was back again in Egypt for a solo exhibition at Art Talks gallery, which was saturated with visitors eager to get a closer look at his larger-than-life calligraphy paintings. Another group of artists reused waste and repurposed it through the From Rags to Riches project, organised by Baad El-Bahr for Cultural Development and curated Mashrabia Gallery. The project involved a long-term workshop that culminated in diverse and large-scale public artworks, currently displayed in an exhibition at the Office for Swiss Cooperation in Garden City. “We hope to see a different kind of beauty that does not revolve around bronze, granite, marble, rock, and all other traditional and costly materials,” Stefania Angarano said of the project in an interview with Ahram Online. Throughout the year, galleries brimmed with exhibitions. Some notable ones include prolific artist Nagy Shaker’s thorough retrospective, as well as Keizer’s solo at Mashrabia, which sees the artist taking street art into the gallery and out again with his artistic flexibility. There was also a special interest in Egyptian surrealism pioneers The Art and Freedom Group, with this year seeing several exhibitions focused on their works and tracing their influence on Egyptian modern art. One of the exhibitions was held in September at Cairo’s Palace of Arts, titled ‘When Art Becomes Liberty: The Egyptian Surrealists (1938-1965),’ and is set to go on an international tour to end in Sharjah, UAE in November 2017. Another exhibition was at the renowned Centre Pompidou in Paris. 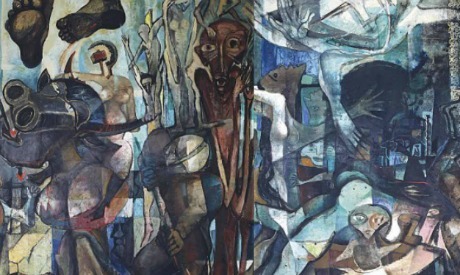 Titled Art et Liberté: Rupture, War and Surrealism in Egypt (1938-1948). The exhibition is currently running until 9 January. The Sharjah Art Museum also held an exhibition on the same thread, titled Kamal Youssef: Egyptian Surrealism’s Time Capsule. Even outside of Cairo, young artists reaped the benefits of Mass Alexandria’s programme, which is back on the scene after a two-year hiatus to offer artists an alternative education programme that helps them develop their theory and practice. This year also saw triumph in the face of legal challenges that threatened several artistic institutions, including the long-standing godfather of alternative art spaces Townhouse Gallery. The gallery is currently operating, and is as present as ever, despite facing closure by authorities and losing part of its headquarters, which included a newly expanded exhibition space, due to a building collapse. Adapting swiftly, Townhouse resumed its exhibition activity with Bryone Dunne’s ‘They Usually Lie in The Grotto,’ held in its Factory Space; a wide warehouse-like space which now also encompasses the Townhouse library, the art shop as well as the staff offices. This new setup is serendipitously more modern and interesting than it was previously, with Townhouse rising from the ashes. As the year comes to a close, perhaps the visual art scene has planted seeds that will continue to blossom and ripple into coming years.